Gov. Doug Ducey vetoed a tax conformity bill, setting up a showdown with Republican legislators and injecting more uncertainty for Arizonans who are preparing to file their 2018 taxes. Senate Bill 1143 would have conformed Arizona’s income tax code to its federal counterpart, including the elimination of a handful of itemized deductions that were scrapped at the federal level in 2017. To offset the loss of those deductions, Republican lawmakers reduced income tax rates by 0.11 percentage points. The bill would have applied only to the 2018 tax year. “I’m vetoing this bill because it’s bad public policy. It was poorly conceived and was hastily passed, for no good reason. We’ve been here before: state leaders hastily passed fiscal policy without thinking through the consequences. We need a more thoughtful approach,” the governor tweeted. The governor has repeatedly said he wants any extra revenue generated by tax conformity for 2018 to go into the state’s rainy day fund. He has vowed to increase the fund, which is a reserve of cash to be used in the event of budget shortfalls, one of his top agenda items for the legislative session. In his tweets, Ducey pledged to both conform and to increase the rainy day fund, and also said Arizona will not raise taxes. It’s unclear whether he plans to bolster the rainy day fund using revenue generated by conformity in 2018 or in future years. Republicans lawmakers view the elimination of the itemized deductions to be a substantial tax increase, and included a $150 million income tax cut in SB 1143 to offset the cost. Sen. J.D. Mesnard, the bill’s sponsor, said a tax increase would be a “mathematical certainty” if the state conforms without finding a way to offset the increased taxes that some Arizonans will pay through the elimination of itemized deductions. Legislative and executive branch estimates on how much revenue the state would generate from simple conformity – conforming without a offsetting the cost of the lost deductions – range from about $174 million to $228 million. Some of Ducey’s tweets appeared contradictory or unclear. He wrote that it “makes no sense and it’s irresponsible” to retroactively change the tax code for 2018, based on uncertain revenue estimates, after Arizonans have already started filing tax returns. But the in next tweet, he said, “We will conform in 2018, 2019, and conform going forward.” In the same tweet, he said there’s plenty of time to conform for 2019 and future years. In another tweet, Ducey said he will veto any budget that doesn’t align with the Arizona Department of Revenue’s tax forms. But the department’s recently issued forms include assumptions that the state will conform the 2018 tax year to federal tax code, which can’t happen without conformity legislation. Ducey spokesman Patrick Ptak told the Mirror that the governor wants tax conformity for 2018. He said Ducey will not retroactively change tax rates, rather than tax codes, as the governor said in his tweet. In his veto letter, Ducey wrote that any bill with a fiscal impact should be part of budget negotiations between the Legislature and the governor. However, many Arizonans will have already filed their taxes by the time a budget is passed, and there’s no guarantee that a budget will be finalized by the April 15 tax deadline. Mesnard said Ducey’s veto creates uncertainty for Arizonans as the tax-filing season begins. And he emphasized that conformity cannot happen without another bill. Mesnard said Ducey will have trouble getting any Republican votes or sponsors if that bill raises Arizonans’ taxes. “I’m going to fight him and Republicans are going to fight him. We oppose tax increases,” he said. Rep. Ben Toma, R-Peoria, who sponsored an identical bill to SB 1143, said he’s disappointed by Ducey’s veto, but that he’ll wait to see what the governor’s conformity plan is. “I can tell you that I won’t vote for something without an offset, nor will I hear it in (committee), nor will I vote for a budget that includes conformity without some offsets,” said Toma, who chairs the House Ways and Means Committee. While Ducey tweeted that it would be irresponsible to retroactively change the tax code for a year that is already over, Mesnard said he pushed for conformity last year for that exact reason. He said his effort fell short because Ducey opposed it. “He didn’t want to do it. He wouldn’t budge last year. He said we’ll do it next year. And here we are, next year, and he’s saying we can’t do it because it’s too late. So, obviously, last year was a stall tactic,” Mesnard said. Mesnard also advocated for a special session in November or December so the Legislature could pass a conformity bill before the new year began and people started filing their taxes for 2018. Ducey rejected the idea, saying conformity could wait until the regular session. Mesnard said Ducey will never get Republicans votes for a budget that includes conformity without a fiscal offset, and said he assumes the governor must be planning to work with legislative Democrats on a vote. However, Democrats have been no more receptive to Ducey’s tax conformity plans than Republicans have, though for different reasons. Democrats want to use the additional revenue from tax conformity to increase K-12 education funding, and have vocally opposed any offset, which they largely regard as a tax cut. SB 1143 passed on a party-line vote, with every Democrat voting against it and all but one Republican voting for it. 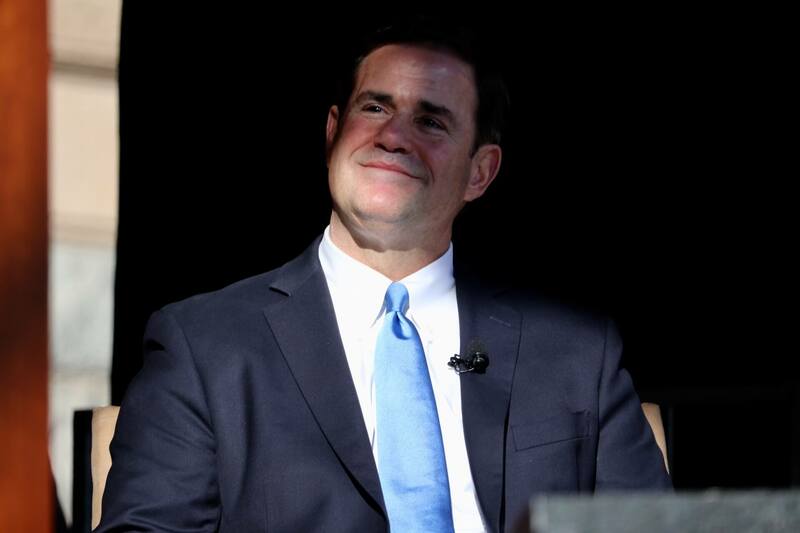 Since he began his campaign for his first term in 2014, Ducey has vowed to never raise taxes. However, the tax conformity fight is the second time in the past year in which Republican lawmakers have accused him of breaking that pledge. In 2018, Ducey signed a bill authorized the director of the Arizona Department of Transportation to set and collect a vehicle registration fee, with the money going to fund the Department of Public Safety’s Highway Patrol operations. Lawmakers were told the fee would be around $18, but ADOT Director John Halikowski instead set it at $32. The law passed with mostly Democratic support, but there is now bipartisan support to repeal it.